The First, ANBA recently donated $500 to the Hancock County Food Pantry to support their mission to provide food to low income families that have an immediate "crisis or emergency" need for assistance. The First, ANBA would like to thank the Food Pantry for its many years of providing such a needed and vital service to our community and also to thank the many Food Pantry volunteers for their countless hours of community service. Pictured (left to right) are Marilyn Finch, Vice President and Branch Manager for The First ANBA; Jim Collins, Food Pantry Executive Director and Micah Necaise, Hancock County Market President for The First, ANBA. ​Hollywood Gulf Coast is proud to support Hancock County Food Pantry. Hollywood Gulf Coast donated $2,000 to help them with their programs and services. In addition the property donated 215 pounds of food that was donated from a recent golf tournament at The Bridges. ​Pictured from left to right: Monica Scott (VP of Marketing), Jim Collins (Executive Director for Hancock County Food Pantry), Bernie Hanson (VP of Finance), Susan Foster (VP of Casino Operations), Marcie Baria (Chairman of Board for Hancock County Food Pantry), Cynthia Simms (VP of Human Resources and Board Member of Hancock County Food Pantry), Peg Walton (Volunteer Coordinator Hancock County Food Pantry) and John Wittliff (Treasurer Hancock County Food Pantry). 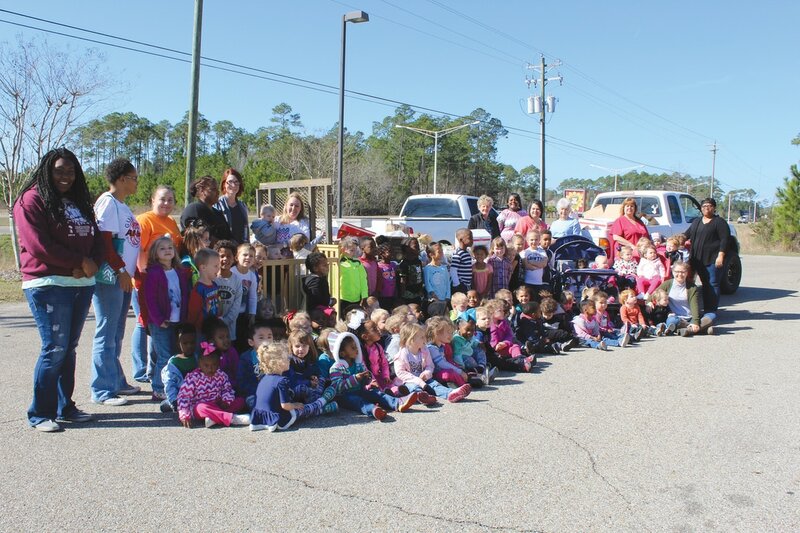 Children who attend the Hancock County Child Development Center in Bay St. Louis posed in front of trailers full of more than 10,171 items collected in a recent food drive that were donated to the Hancock County Food Pantry and King’s Kitchen. Ten classrooms participated in the food drive and the students who collected the most items were named the king and queen of their class. The kings and queens were: Cannon Gerrard and Jaycie Kreeger in the infant class; Kamden Peterson and Kinsley Champeau of the young ones class; Gage Lackey and Paisley Rutherford of the older ones class; Collin Patin and Allie Brennan of the young 2’s class; Izaak Cumberland and Ryleigh Peterson of the older 2’s class; Roman Hosty and Karita King of the 2’s and 3’s class; Elijah McKay and Avah Lewis of the 3’s class; Tommy Raver and Scarlette Deadrick of the 3’s class; Drake Sellier and Ashlyn Ramsay of the 3’s and 4’s class and Ehrmani Payne and Jayden Brennan of the 4’s class. Parker Freeman and Brelynn Earles, who collected the most food items were named Mr. and Mrs. CDC They rode in the school’s Mardi Gras parade held at the Child Development Center, located at 9930 Highway 603 in Bay St. Louis. The Bay St. Louis Old Town Merchants Association celebrated Souper Mudfest as part of the March Second Saturday Artwalk. Participants purchased handmade soup bowls made by local potters and visited local merchants, who provided free soup, chili and stew. The funds raised benefited the Hancock County Food Pantry, Hancock County Tourism and the Old Town Merchants Association. The Food Pantry received a donation of $1465 from the Souper Mudfest. ​After Keesler Federal officials saw a recent WLOX story on the Hancock County Food Pantry and its need for assistance, the credit union took action. Keesler Federal donated $1,000 to the non-profit that helps 30 to 35 residents a day and anticipates increasing needs with the holiday season approaching. Pictured are Keesler Federal Director of Marketing Pam Belk, Hancock Country Food Pantry Director Jim Collins and Keesler Federal President and CEO Andy Swoger. While learning civic responsibilities, students also have a contest to see which grades can bring in the most food/hygiene items. This year, students were most generous, bringing in vegetables and meat related items such as canned tuna and chicken. In the contest, students in k, 1, 2 competed for the most donated items. Grades 3, 4, 5 also competed against each others classes for a free dress day and popcorn party. A graph is posted in the hallway showing donations per class. Students can use their skills to determine which class is in the lead each day, but the last day is often a surprise. The last day, the donations sometimes shift and the class who was in the lead, is no longer in the lead! 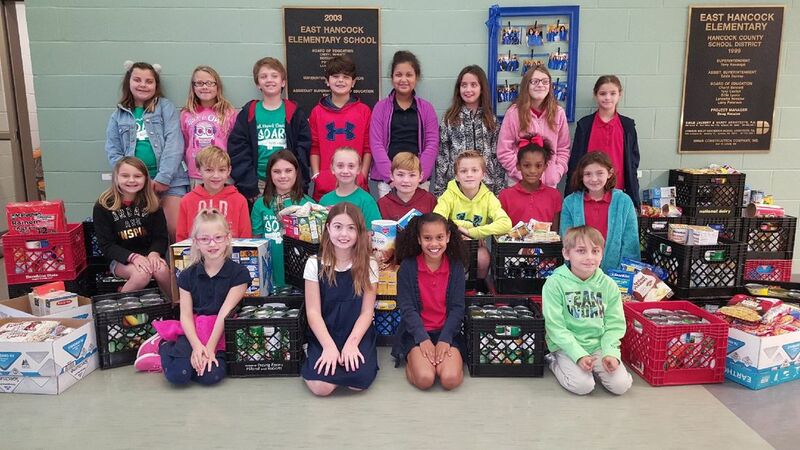 In grades 3, 4, 5, Ms. Moore’s class brought in 189 food items, with second place going to Ms. Hoda with 108 items. In K, 1, 2, Mrs. Courtalt’s class brought in 165 food items with Mrs. Perniciaro second, 119 items. The national standard for food drives is measured by weight. For this food drive, 1,566 pounds were donated. Students and families were very generous with the donations. Real food with protein was donated that a person could eat and get full. There was very little fluff this year like gravy mixes. Enough canned meats were donated, to fill three crates! A total of 1,661 items were brought in for the food drive which will be a great help to the Hancock County Food Pantry which is in desperate need at this time. The Hancock County Food Pantry was established in 1986 by area churches and has provided free food for over 256,000 individuals from over 105,000 families since then. Back row left to right: Cecilia Server, Brianna Miner, Cameron Pedron, Daiden Miller, Ashtyn Burton, Isabella Morales, Emily Hickson, and Neveah Ward. 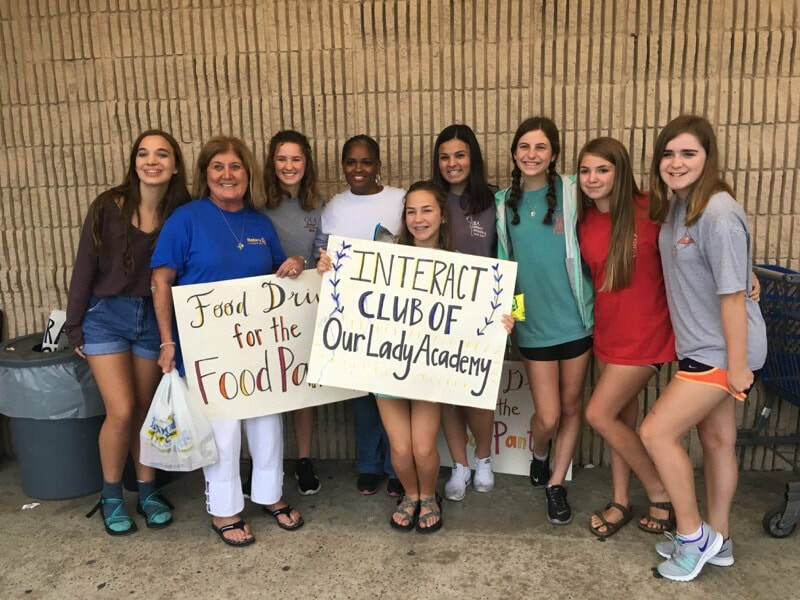 Our Lady Academy’s (OLA) Interact Club spent a weekend recently at Froogel’s grocery store in Bay St. Louis accepting donations needed for the Hancock County Food Pantry. They raised over $500 in two days, including 20 large boxes packed with canned food and 5 grocery carts filled with non-perishable items. In addition, the students hosted a breakfast sale at OLA recently which pulled in more than $150.00 to add to their donation. From left are Gretchen Darby, Lisa Dufrene, Blake Fortner and Ja’Von Simpson.